Looking for a laid back and easy keeper? Then consider Ginger! This wonderful girl is a short-haired Calico that was found in a box at our backdoor along with her sister Grayson. 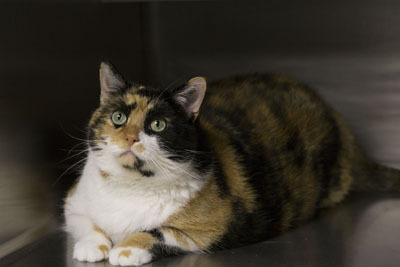 She is about sixteen pounds and a bit overweight, so she would love a home where her owners can get her to a healthier weight. She is quiet and easy going, enjoys a good head rub and being brushed. 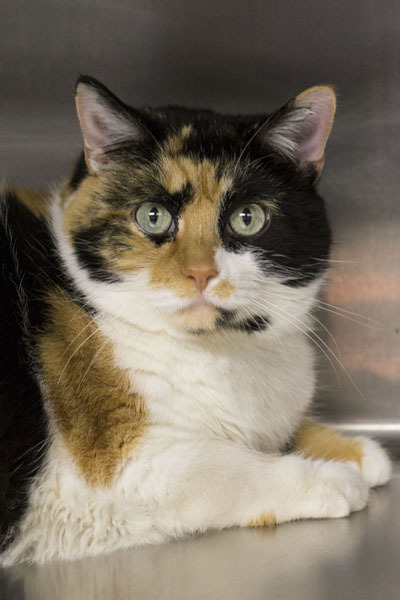 Since she was abandoned, we are not sure how well she would do with kids so slow introductions are recommended. Ginger is a lucky girl, having found a forever home on June 29, 2014.